Yogyakarta, on Monday August 13, 2018 the close defense for Hazel D. Jovita, a student of Political Islam titled “Cross-Sectoral Collaboration In The Philippines’ Disaster Management” was conducted. The close defense was in Study Hall, 1st Floor of Graduate Building, Universitas Muhammadiyah Yogyakarta. Hazel explained that the mandated tall-structure and the lead-organization form of network governance as stipulated in Republic Act 10121, does not work in the regional and local disaster management networks in Region 10, particularly during Typhoon Washi in 2010. In the regional level, such structure does not build interdependencies among agencies while at the local level, disaster response operations are constrained by bureaucratic protocols making disaster management networks ineffective. In the regional level, where many agencies and organizations are involved, the existing less centralized structure of decision making should be transformed into a highly centralized structure while disaster operations should be improved through coordination in all level of disaster operations and intensified collaboration with non-government agencies. She added that the disaster management structure significantly affects the governance processes of the network. In order for the disaster management network to be effective, the structure of the DRRM network should evolve. Shared governance in the local disaster response network should be considered to enhance the competence of the local agencies. Additionally, disaster leadership should be effective enough to provide captivating incentives, build interdependencies and strengthen trust among members through a sustained collaborative activity. The absence of a strong intergovernmental and inter-organizational relationships and disaster management champions, disaster response operations in the country will remain in limbo. 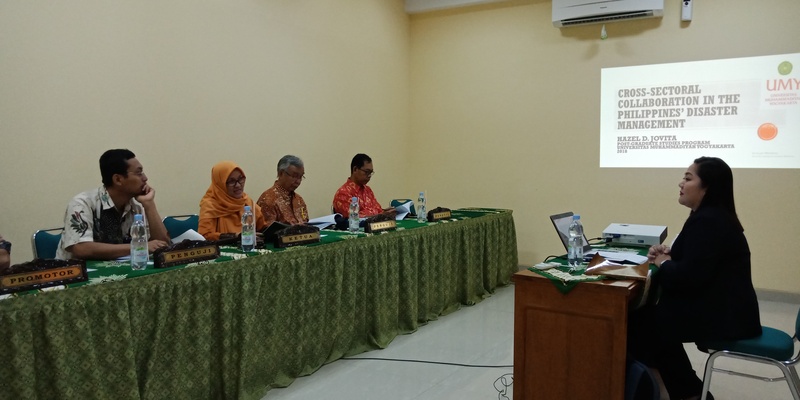 The Assessors/Examiners are Dr. Mega Hidayati, M.A (Chairman), Prof. Dr. Tulus Warsito, M.Si (Promoter / Examiner I), Prof. Dr. Achmad Nurmandi, M.Sc (Co-promoter I / Examiner II), Eko Priyo Purnomo, M.Res., Ph.D (Examiner III), Prof. Dr. Sjafri Sairin, M.A (Examiner IV), and Dr. Ulung Pribadi, M.Si (Examiner V). After considering the answers of the Assessor Team’s questions and objections, the assessors/examiners agreed Hazel D. Jovita to join opened defense by revision. Hazel D. Jovita was required to improve his dissertation as the Assessors/examiners Team’s advice, input, and direction.